Smuggling is one of the best practices to develop creativity, something that the Hong Kong-China border knows very well given the price difference between one location and another, which promotes these practices. Without going any further, a few months ago we told you that a lady had been caught carrying an iPhone between her chest and back . Obviously, they caught him. And it is one thing to strain one terminal and another to exceed one hundred. So now the smugglers have decided to go a step further and use technology to commit this crime in a big way, specifically with a stash of more than 15,000 iPhone valued at almost 80 million dollars . How they did it? With drones. Imagine a flock of drones carrying bags with iPhone. As Amazon pretend to do with your orders, but secretly. On March 29 they caught a drone and began to suspect. 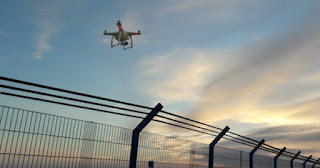 In a matter of hours, they had captured 26 suspects accused of flying drones to cross the border between Shenzhen and Hong Kong . The smugglers operated during the night and in a matter of seconds achieved their goal. In each bag there were 10 reconditioned iPhone, but imagine how many times they repeated the process during the night to reach 15,000 phones . Drones have become the new favorite object for smuggling, especially in drug trafficking, but as you can see in this case, they can be used for many other things. China has been tough on drones and their legislation , considering that it is the country in the world that makes the most of them and the numerous incidents that have taken place on their borders. Although they may seem like a toy, the use and handling in urban areas by non-expert personnel may constitute a risk in the event of an accident.